The technical details of The Wedding Dress are well done. 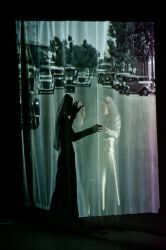 With a set design by Vicki Davis, lighting by Maja White and sound and projections design by David Crandall, the initial view is of a small cramped stage with a white, gauzy, translucent curtain used as a projection screen. A projection of 1940′s cars are moving toward the audience. There is a screech, a scream and then the curtain is moved to show a deep, deep stage setting strewn with the detractions of an unraveling mind. There are about ten pipes at center stage like the ganglia of the mind. Around the set are several mannequins and movable set pieces including a fabricated old-style tri-pod camera. Actors in freeze positions are often props until awakened into action by Alaide’s thoughts. 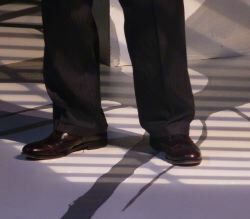 The actors hide about the stage like when, for some of us, we know the name of someone, but just can’t find it in our brains for a moment. Costumes from Erik Teague give a visual taste of the early 20th century with woman in stiff, low bodice, black brocades with bright crimson flower designs. As Adaile’s mind shifts back to the 1940′s all the characters, except for Madame Clessi, are attired in more modern outfits. There are plenty of white linen suits, dark mourning attire, and two virginally pure white satin wedding dresses. This article can be linked to as: http://showbizradio.com/go/9955.